Searching for certain texts on homeopathy I stumbled over the “market research” survey of a certain company. Trying to find out more about homeopathy and market research I scanned web-sites of Kantar, which at that time I thought to be an Indian company. But it is not. Kantar is, so they say, world’s largest opinion research/market research company, a globally spread multi-lingual (mostly English, of course) enterprise. I followed the traces, collected more sites and, several computer days in the Net and 7 GigaBytes later, I had over 600 domains – and an astonishing result. I had started with a newspaper text that based on a market research paper on homeopathy. Curious, I checked opinion research/market research company sites for statements or (at least) even mentioning homeopathy. I expected some hints to suspicions I had, but … instead of a wealth of information I found the contrary: there seems to exist nearly nothing of market research for homeopathy. How can this be? : a billion-Euro-market and nearly no market research…? Of course the homeopaths boast with the 62 percent of India, and with the other high values. And the UK (I had not known the Brits are so much brighter than the Germans) is nearly dead end for homeopathy: mere 15 percent! What do the figures stand for? The visible statement is: “I trust homeopathic medicine”. Is that all? What about the conditions? Under which conditions do the people (asked in that survey back in 2008) live? To which extend to they trust homeopathy? And for which diseases? No matter under which conditions the surveys in the various countries were made, the figures are a disaster. In the UK 85 percent of the population (according to the figures – and that is what the homeopathica manufacturers can quote) do not trust homeopathy. 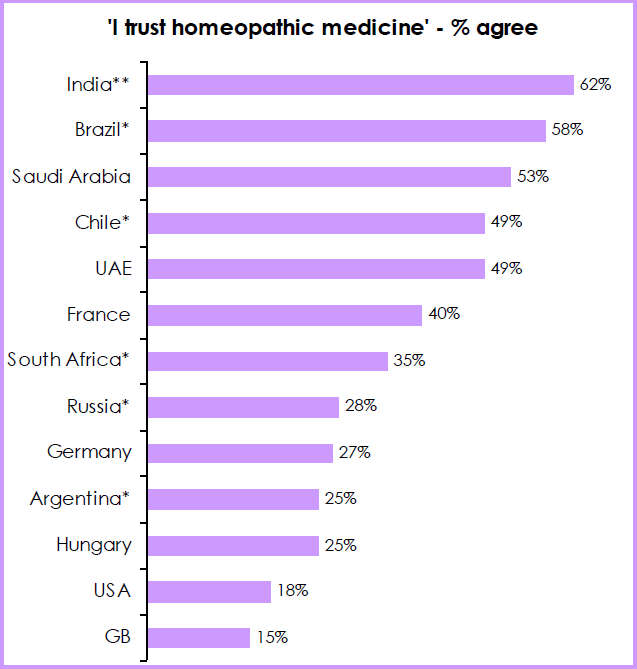 In Germany people are a bit dense (and stronger brainwashed by fraudulent media over the decades), but, still, 3/4 of the population do not trust homeopathy. Who, with these miserable figures, would go on and make more costly surveys? No one. The surveys would only reveal what already is known from the sales figures. So, that is the reason: homeopathy is known as being rubbish. People do not want it. People do not take it. Market research would only show this, again and ever again.